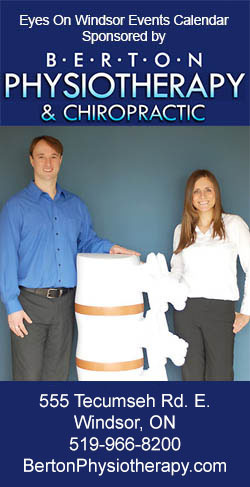 Posted on May 1, 2013 by Eric Bonnici wrote in Restaurant News. It has 1 Comment. 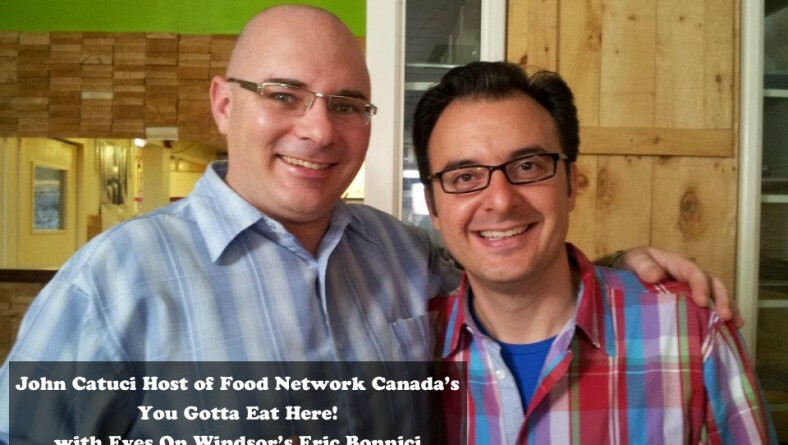 Food Network Canada’s hit television show, You Gotta Eat Here!, hosted by funny guy John Catucci will return to film an episode in Kingsville Ontario at Jack’s Gastropub. The producers must have heard we have two of the best restaurants in the country when it comes to gourmet burgers. Last summer the crew of You Gotta Eat Here! filmed episodes at Smoke N’ Spice and Motorburger. 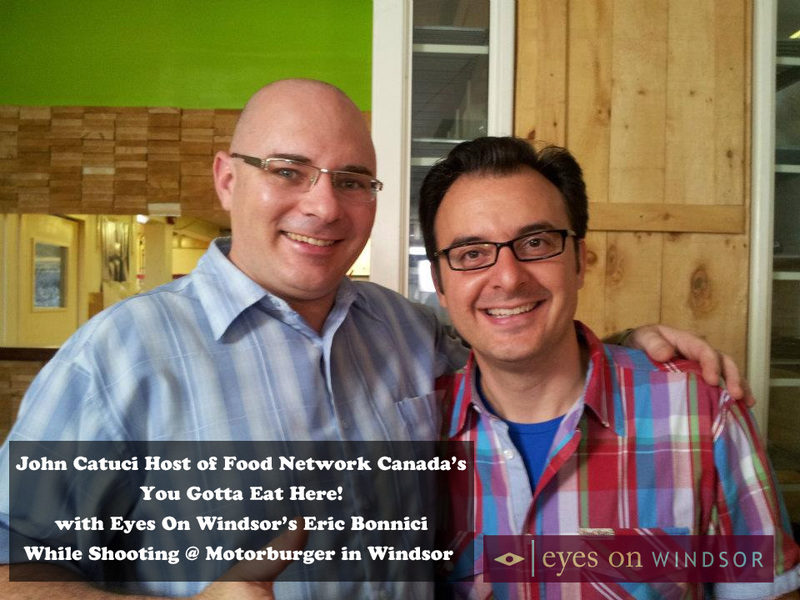 As you can see from the picture I was lucky enough to meet Catucci himself as they filmed at Motorburger this past summer. Now they’re back this time to dine at Jack’s Gastropub. For National Burger Day 2011, Jack’s Gastropub’s juicy gourmet burgers were named as the “must-have burger gem” and local favourite for Windsor & Essex County. From personal experience, as expressed in our review of Jack’s Gastropub, I can vouch for this. In fact, of all the burgers we’ve tried so far in Windsor Essex, Motorburger and Jack’s are the two best handmade burger makers around. 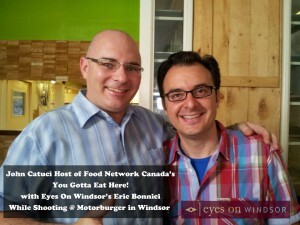 Catucci raved about Motorburger and we’re sure he’ll fall in love with Jack’s burgers too! Of course, the small town friendly service and ambiance of Jack’s charming Victorian-era home built during the late 1800s will make for great T.V. as well. Filming takes place starting June 13, 2013. So if you want a chance to be on the hit T.V. show You Gotta Eat Here! then make sure you stop in for a bite to eat during that time at Jack’s Gastropub in Kingsville. 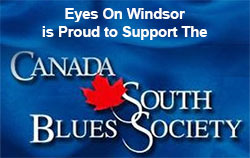 Update: Jack’s Gastropub Named one of The 3 Best Burger Restaurants in Windsor Essex by Eyes on Windsor. Update 2: Blackjack Gastrovan to debut during You Gotta Eat Here Filming of Jack’s Gastropub on June 13th, 2013. Love Jack’s but when are we going to see it on tv.